Here we go again. A new nominee for the post of Head of State and new threats of protest action. With government's nomination of Charles Angelo Savarin to the post of President of Dominica, the Opposition United Workers Party (UWP), the Dominica Public Service Union (DPSU) and pastor of the Trinity Baptist Church, Randy Rodney, say the country is effectively back to square one. "This will not stand, this will not be allowed to stand in Dominica," declared UWP political leader Lennox Linton on the Q95 talk show hosted by Matt Peltier on Thursday September 26, 2013. Additionally, Pastor Randy Rodney said the decision was "malicious". "The nomination reflects the quality of the leadership we are having. 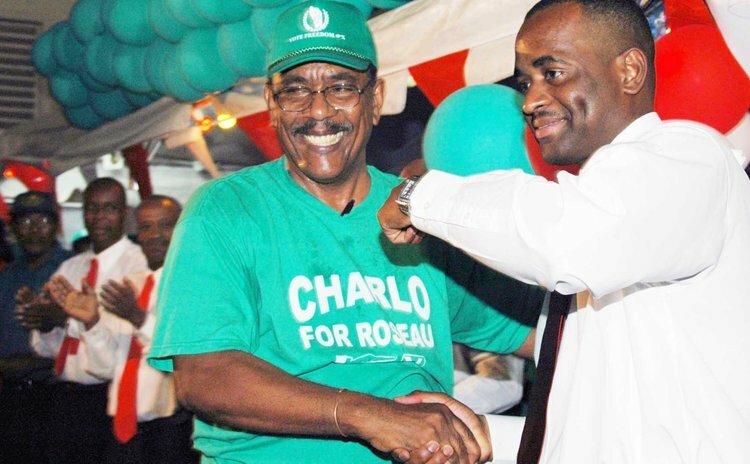 Coming straight from the 'crass politics' that Charles Savarin has been involved in to have him resign as a government minister and immediately to the post of President is wrong and bad," Rodney stated. Savarin, he said, is "partisan, divisive and he has even attacked people in business places because he is so party partisan and divisive, he does not fit the post of President." "I am disappointed that the DLP cannot find someone who is sympathetic to the party and command the respect of all Dominicans," he said. " Six of one and half a dozen of the other just like the Alix Boyd Knights matter…my advice to them, is go sit down and extend the current term of the president as mandated by the constitution, there should be no hurry. That decision is a travesty and bad, they knew the term of the president was ending and had 90 days to deal with it. That is pure malice on the leadership and bad." Savarin, a government-appointed senator, resigned as Minister of Labour and National Security on September 24, 2013 to take up the post of President of Dominica after it was discovered that Government's second nominee, Jennifer Wallace-Lafond, was the holder of a United States of America passport and was therefore was disqualified from holding the post. In the past, Savarin has been openly critical of the UWP and he is also a member of the governing Dominica Labour Party (DLP). Linton, who vowed to "stand up against that decision", stated further that, "Mr. Savarin has demonstrated over the years that he is so un-curably and party partisan that he simply cannot fit the bill of being an independent, objective, impartial holder of the office of President." Linton said Savarin has sworn to an affidavit in court in which he took objection "to Dave Bruney sitting on the IPO because Dave Bruney hosted a programme for the United Workers Party. "In the same affidavit Charles Savarin is confirming he is a host of the next level programme for the Labour Party on Kairi FM…that is the same Charles Savarin who, having argued that partisanship should not come into the IPO, is walking out of the partisan position of being a minister of government, member of the Skerrit Cabinet today and walking into the presidency tomorrow," UWP Linton stated. General Secretary of the Dominica Public Service Union (DPSU) Thomas Letang is also against the Savarin nomination. "For the good of the country, I believe whoever is selected as president should be one that is acceptable by all individuals from all political spectrums and sides and one who will unite our country," Letang said. "I had no problems that Mr. Eluid Williams should have continued as president and he should have been made to continue". Letang called on the Government to invoke the clause of the Constitution which makes provision for the term of the president to be extended for six months.